Endless develops high performance brake solutions for the most demanding competition usage from WRC rally teams, British Touring cars, Australian V8 Touring cars and much more, for short sprint races to extreme endurance races. In addition to the range of competition brake pads, Endless has also developed a range of high performance street pads which will also let you tackle track work with ease. 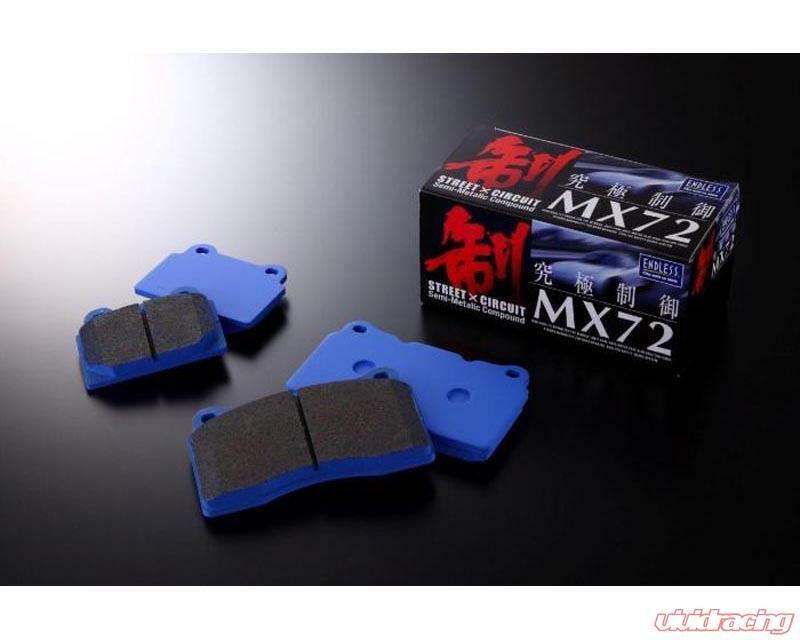 The MX72 is a ceramic-carbon-metallic compound, which is developed for fast road cars to be used at high speed driving with repeated braking and acceleration. It is suited for use in a power brake system with or without ABS. The MX72 is a high heat resistance compound which can also be used for circuit racing, like a sports car club race day. There is no need to change pads for such an event. The initial bite and response is excellent even at high speed like 250 300km/h and also the pedal feel and brake balance. The MX72 is also developed to go together with mass produced standard rotors with a lower steel quality and still not wear the rotors down or cause problems with heat cracks even at high temperatures. The wear of the pad is also exceptionally low, which makes for a good economical aspect. It has, just like the race compounds, a high degree of anti water fade even if cross drilled or grooved rotors are not used. The MX72 is also developed to be used in cold weather conditions. The pad response is still good in these instances. Depending on caliper construction, rotor materials etc, it can sometimes happen that noise can appear at low temperatures and low speeds, but this is normally not a big problem to sort out.